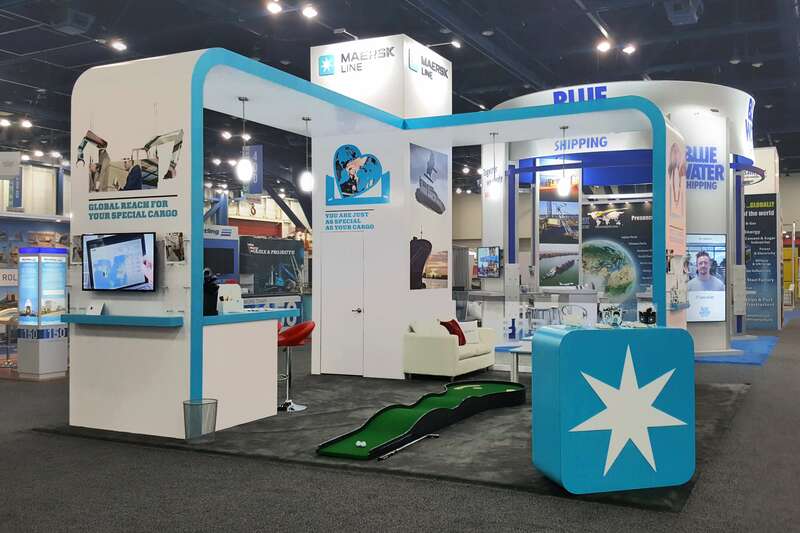 Maersk is the world’s largest container shipping company and sought out Exhibit Network to build a new 20×20 custom exhibit for Breakbulk Americas, October 2017, in Houston. Their top priority was a semi-private meeting area, followed by a sleek, modern look; prominent visibility on the show floor; an interactive touchscreen; additional video monitors; iPad stands; charging stations; literature racks; and storage. Maersk also wanted to promote a nightly drawing for a Maersk Ship Lego Set. Exhibit Network began designing this island exhibit in late August and fabrication started in mid-September 2017. As the parts were produced, they were set-up and test-fit inhouse to ensure an efficient installation on showsite. Maersk provided the artwork for the large-format graphics. Maersk’s original intent was to showcase the Lego Set in the box, but our crew went the extra mile and built one of the Lego Ships and put it in a plexi display case. (Actually, the Lego Ship was put together by the 11-year old grandson of one of our employees.) Our contact at Maersk was informed of the progress throughout the fabrication process, but never saw the exhibit until it was completely installed at showsite. At the time of this writing, this exhibit is being modified and made ready for Breakbulk Americas 2018.